My previous results for an update-only workload to a cached and IO-bound database used a table that did not require secondary index maintenance from the update. Prior to that I ran tests using mysqlslap and might have found a regression in InnoDB when the update requires secondary index maintenance (bug 74235). The mysqlslap test did all updates to the same row. The test I describe here chooses the row to update at random and this workload does not reproduce the worst case from bug 74235. 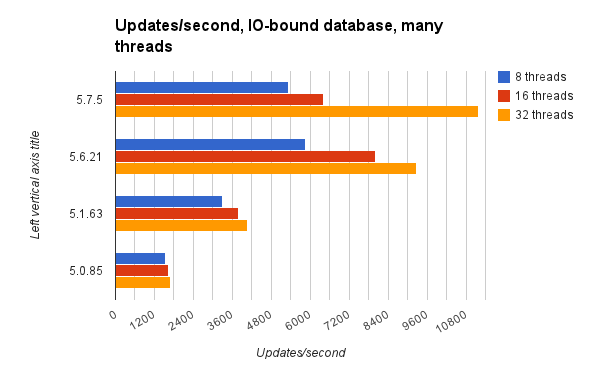 The results are that newer releases tend to do worse at 1 thread, 5.7.5 does best at 32 threads and 5.7.5 does slightly worse than 5.6.21 at less than 32 threads. We need to fix the regressions in 5.7.5 at less-than-high concurrency workloads. There were 8 tables in the database with 8M rows per table. 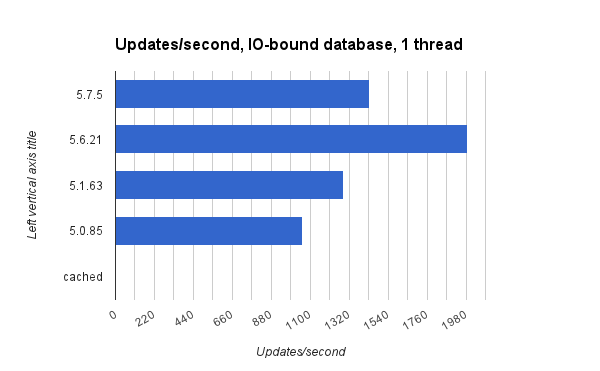 Tests were run for 1 thread with 1 table and 8, 16, 32 threads with 8 tables. The test at each concurrency level was run for 10 minutes. 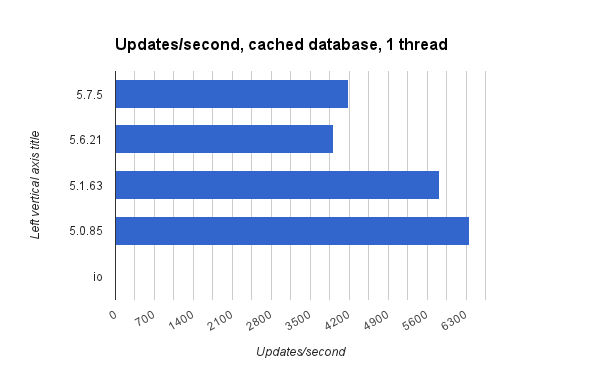 Tests were run for a 1G (IO-bound) and 32G (cached) InnoDB buffer pool. For the cached test the tables were read into the buffer pool at test start. The updates/second rate from these tests had more variance than previous tests. I ran tests many times and report rates here that were typical. For the 1-thread tests that use 1 table, the database (1 table) is 2G. For the 8, 16 and 32 thread tests that use 8 tables the database (8 tables) is 16G. 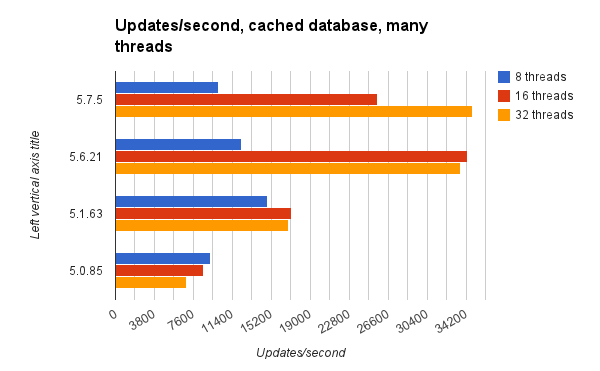 The rates for a cached database and 1 thread match most previous results -- newer releases are much slower than older releases and MySQL 5.7.5 is about 1.5X worse than MySQL 5.0.85. The results for the IO-bound setup don't follow that trend. Newer releases do better. I regret that I did not have the time to explain the difference between 5.6.21 and 5.7.5. MySQL 5.7.5 and 5.6.21 are much better than older releases. 5.6.21 does better than 5.7.5 at 8 and 16 threads while 5.7.5 is the best at 32 threads.